Trailer sway must always be considered in trailer towing. Unwanted sway turns a pleasant towing situation sour. Many factors can contribute to trailer sway - the design of the trailer, the suspension, tire inflation pressures, configuration of the tow vehicle, towing speeds and hitch weight. Therefore, Hidden Hitch has devised several options to resist or prevent trailer sway. Many trailers are prone to sway problems due to windy conditions or other factors. 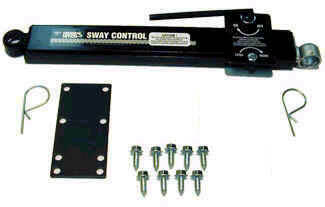 Sway Control Bars work between the hitch and the trailer to resist sway. All Hidden Hitch weight distributing heads are equipped to accept sway controls. A Pole Tongue Adapter is used as a mounting platform for the Lift Brackets of a Weight Distributing Hitch Systems when a trailer has a pole or straight tongue rather than an A-frame Tongue. Description Gross Trailer Wt. Tongue Wt.